How far are we from developing self-sufficient space stations? 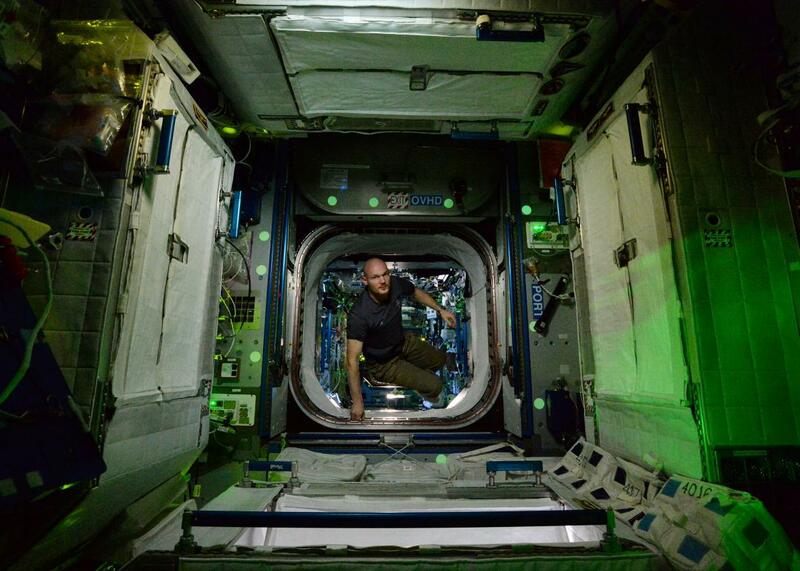 An astronaut aboard the International Space Station on Oct. 31, 2014. Truly totally self-sufficient space stations? Nowhere near—not if you mean able to make and repair all the complex machinery, space suits, life-support systems, computers, modules, and so on. Nobody is attempting that either. What they are attempting is to cycle around all the oxygen to breathe. At the moment they lose a lot of the oxygen into space as CO or CO2; in future, they could convert that to methane and lose only carbon and hydrogen and cycle around the oxygen. They’re also attempting to grow all their food and to use 3-D printers to make some of the replacement parts. They are not attempting to remake complex things like space suits in space. A space suit takes months to build by skilled people and costs millions of dollars to build it on Earth with all our facilities. At present, it’s not likely that we can build them in space with 3-D printers. If we could, we could build them on Earth with 3-D printers far more easily, and the price would drop to just the cost of the materials. That’s not likely at present. With those limited aims, they are making some progress. But the International Space Station is nowhere near able to achieve even recycling all its oxygen. That is an aim, however, for the next generation of life-support systems: to generate a higher and higher percentage of their oxygen. There have been experiments on Earth, especially BIOS-3 and some in the U.S., that got close to growing much of their own food, but they have not yet been duplicated in the more challenging conditions in space. This is with aeroponics (plants with their roots growing in water vapour in air) and hydroponics (roots growing in water), and doing multiple cropping of dwarf wheat, beet, radish, and other quick-growing crops. They could get the bulk of their food using just 13 square meters of growing area per person—not everything, but most of it. The most active at present toward achieving self-sufficency in food is MELiSSA. It uses a somewhat different system with more microbes. The main difference is that BIOS-3 burns plant wastes in an oven, while MELiSSA relies extensively on high-tech composting—lots of microbes. It is already doing tests on the ISS for the first part and generating oxygen from algae. We also haven’t yet had a permanent space station. Instead every single module we’ve sent there gets destroyed in the atmosphere within a few decades. That’s not because we can’t keep them up there. Even when we can, as with the ISS, they have finite and rather short lifetimes. We still can’t build modules that will last longer than a few decades in space. While on the ground houses can last for centuries; they need maintenance but don’t have to be completely destroyed and remade every few decades. Space modules are of course far harder to construct than ordinary houses. If it is possible to build them in space—well, it’s a long way away, and first we need to learn how to build something with all the facilities we have on Earth that can survive long-term in space. The idea of self-sufficient space colonies that could make everything in space—including space suits, cooling systems, environment control, meteorite shields, air locks, venting, systems to stop buildup of various poisonous gases and microbes, and so on—without relying on Earth industry is way into the realms of science fiction at present. Remember, if you could do that, you could also do the same, in, say, the Sahara, Siberia, or Alaska far more easily, as you don’t need to make your own air to breath there. Perhaps one day this will be possible, but that would be a totally transformed Earth. In some ways, as space and science fiction geek, I’d love to see this. In other ways, I think we are just not ready for this technology yet. Because if you can build space suits and environmental control systems and computers as easily as that, you can build just about anything else just using sand, rocks, and other simple ingredients you can find in a desert (similarly to finding them on another moon or planet). What sort of society would that be? Everything would be transformed. Give that technology to us now, and I think you’d get chaos—surely many dangerous things would be easy to make as well. So it is probably a good thing it will surely take a few decades—that is if it is possible for us at all. Despite many occurrences in science fiction, that proves nothing: Science fiction is full of faster-than-light space drives, “beam me up” teleportation drives, and who knows what else. Some of that may happen, but many—even most—of the things it envisions may never happen. I think it is possible we could get nanoreplicators that make everything for us, as after all microbes replicate, so that much is possible, but how controllable is it? Is it really true you could make everything with nanotech machines? I don’t know. Human exploration of Mars: Is it possible to terraform just a portion of Mars by enclosing it in a dome? Space exploration: How is New Horizons of NASA powered? Outer space: How do we know there isn’t another planet beyond Pluto’s orbit?